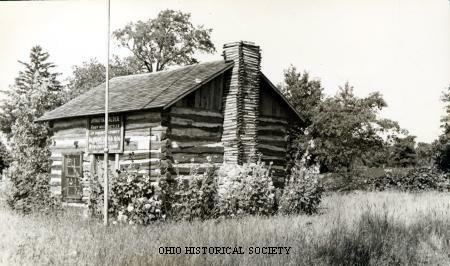 Jonathan Alder's cabin, London, Ohio, ca. 1935. Alder was the first white settler of Madison County. He constructed the cabin in 1806. As it relates to Ohio, the American Frontier Era began with the adoption of the Declaration of Independence on July 4, 1776. Some British colonists, such as missionaries for the Moravian Church, fur trappers, and struggling eastern farmers, had moved west of the Appalachian Mountains to the Ohio Country and other areas before 1776. But the British government's Proclamation of 1763 had made settlement in these locations illegal. Having declared themselves citizens of a country independent from Britain, Americans moved into the Ohio Country at will. Fearing the influx of white settlers, most American Indians living in the region allied themselves with the British government during the American Revolution. The land west of the Appalachian Mountains to the Mississippi River formally became American territory with the Treaty of Paris (1783). Bitter struggles over this land occurred between American settlers and American Indian inhabitants as the two sides struggled for control over the region.